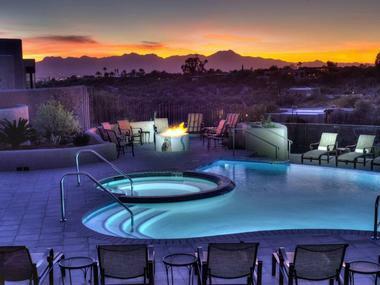 Hacienda Del Sol Guest Ranch Resort is a nationally recognized, desert resort located in Tucson, Arizona. From colorful desert botanicals to luxurious hotel amenities, guests will experience the perfect balance between Southwestern comfort and desert adventure at the Hacienda Del Sol Guest Ranch Resort. There are six different lodging configurations visitors can choose from each with its own style and Spanish name. The distinctive characteristics and amenities of each of these rooms and suites are described below. In each of the Catalina Rooms guests can choose between a king-size bed or two queen-size beds. The approximate square footage of the Catalina Room is 550 sq. 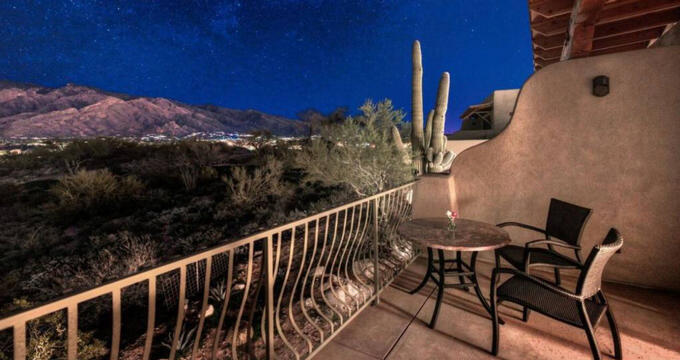 ft. Wood floors and a private patio allow guests to enjoy the mountain and city views below. Other characteristics include ten-foot-high ceilings, handmade furniture, and Talavera tile. Each of the Historic Rooms has its own style and layout. It is one of the most popular rooms at the Hacienda Del Sol Guest Ranch Resort. The Historic Rooms surround the courtyard that is full of colorful landscaping and desert botanicals. There is one queen-size bed in each Historic Room and the room accommodates up to two people. 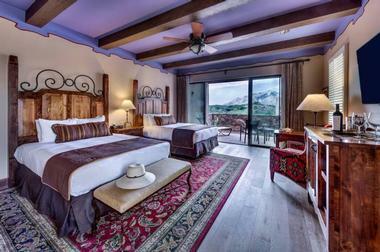 The Hacienda Room – These rooms are known for its handmade wood furniture, and surrounding desert views. Guest can choose between a room with one king-size bed or two queen-size beds. The Hacienda Room is approximately 400 sq. ft. The Deluxe Hacienda Room – These rooms are like the more basic Hacienda Rooms with a few added amenities. Guests can choose between a king-size bed or two queen-size beds. Square footage ranges from 265-700 sq. ft. 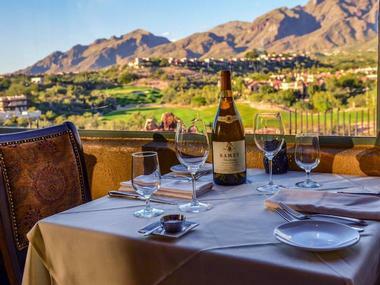 The Deluxe Hacienda Room includes a patio with panoramic views of the desert landscape. Guests can also choose to stay in a suite. Each suite is distinct in its configuration. All suites have a separate living area and a bedroom with a king-size bed. Some suites include a private patio or fireplace. Square footage can range from 700-1000 sq. ft.
Casita – These rooms are a higher-end, more inclusive suite for guests. Amenities include a master suite with king-size bed, kitchenette, fireplace, and private patio. Casita is approximately 1100 sq. ft. The Tracy-Hepburn Casita Grande – This room was named after celebrities Katharine Hepburn and Spencer Tracy. Hepburn and Tracy used to lodge in the Casita Grande. They used this desert suite to escape from the celebrity spotlight. The Tracy-Hepburn Casita Grande has two bedrooms. The first bedroom has a king-size bed and the second has two queen-size beds. The furniture, like other rooms and suits in the Resort, is all handcrafted. There are also two patios, a kitchenette and fireplace. The Casita Grande is known for the privacy it provides its guests. It is also approximately 2000 sq. ft. The Catalina Suite – This luxurious suite was named for its views of the Santa Catalina Mountains. Amenities include private adjoining patios, bedroom with a king-size bed, queen sofa sleeper, two full bathrooms and hand made wood furniture. The Catalina Suite is approximately 1100 sq. ft.
Signature, sweet food amenities are made to order. Guests can order these signature treats before arrival and have them waiting in their room upon arrival. Examples of the edible amenities include topping-filled, specialty popcorn, cheese plates, Hacienda strawberries, gourmet caramel apples, Saguaro sugar cookies and Saguaro sandwich cookies. The spa treatments are unique in that they are done within the privacy of the guest’s own room, suite, or patio. The quality products used by the Hacienda Del Sol Guest Ranch Resort are from the Eminence of Hungary Organic Skin Care product line. Spa treatments include massages, skin care and spa packages. The Hacienda Del Sol Guest Ranch Resort has an outdoor pool and jacuzzi in which guests can relax while looking up at the Santa Catalina Mountains. There is also a fire pit near the pool and jacuzzi, located just beyond the Terraza restaurant. Food and drinks can also be served poolside. The Botanical Gardens is another distinguishable feature of Hacienda Del Sol Guest Ranch Resort. The Garden is always open to guests. There are a variety of desert flowers, sculptures, fountains, and painted garden décor. The Fitness Center is available to guests 24 hours. The center has cardio machines, flat screen televisions, towels, and water for its guests. The Grill and Terraza Garden Patio & Lounge are the two dining options available at the Hacienda Del Sol Guest Ranch Resort. Guests can choose to dine in a more formal, elegant venue, such as the dining room in The Grill. They can also choose a more casual outdoor patio dining experience. The cuisine served at both restaurants at the Resort has received awards and national recognition. The Grill – This in-house restaurant offers breakfast, lunch, and dinner to both guests of the Resort and locals. The large windows provide an amazing view of the lush desert landscape for patrons of the diner. Ingredients used at The Grill come from the Resort’s organic gardens and local growers. For 19 consecutive years, The Grill’s selection of over 700 wines has made the restaurant distinguishable throughout the country. Live guitar music creates a relaxed environment. Every Sunday the restaurant offers an award-winning brunch buffet. Sliced Prime Rib, Eggs Benedict, Waffles and Omelets are just a few of the popular dishes served each Sunday. Terraza Garden Patio & Lounge – This patio diner is known for its outdoor, neighbor-style patio where patrons may enjoy their food “al fresco”. Guests particularly enjoy the specialty drinks along with the appetizers, salads, and sandwiches.